Using honey in tomato sauce is common in Moroccan cooking, and I first tasted the combination when mum made something along those lines years ago. I came pretty close to eating beans and chips with cheese and chilli sauce for dinner tonight, which is a favourite, and it was quarter to ten when I stepped off public transport near my house. However, I made myself go to the shops to get some chicken with which to make this, having decided that something more hearty and less processed (by outside parties i.e. Heinz, rather than by me) was better. So… I finally ate at quarter past eleven, which is certainly excessive for a Monday, but on the plus side I have leftovers for packed lunch tomorrow, and what’s more – it was really delicious. This could be made just using garlic and not with onions in the sauce, and also fruit like chopped dates, apricots or sultanas could be added. But if using fruit, adjust the amount of honey, or it could become too sweet. Trim the chicken of excess fat and skin, and season all over with salt and pepper. In a saucepan, pour in a couple of tablespoons of olive oil or butter and heat. Seal the chicken all over until some bits are slightly browning, then remove and set aside. Add the onions, garlic, cinnamon, ginger, chilli flakes and a pinch of salt. Stir and cook for 5 minutes or so – until the onion is very soft. Re-add the chicken and coat in the onion mix then add the tin of tomatoes, and 1 tin’s worth of water, the tomato puree, the honey and the vinegar. Cook for 30-40 minutes on a low-medium heat – so that it is gently bubbling. During this time, cook the bulgur wheat and toast the nuts, taking care they don’t burn. After most of the time is up, remove the chicken and reduce the sauce for 5-10 minutes. Season well with salt (really pay attention to the seasoning) then re-add the chicken. 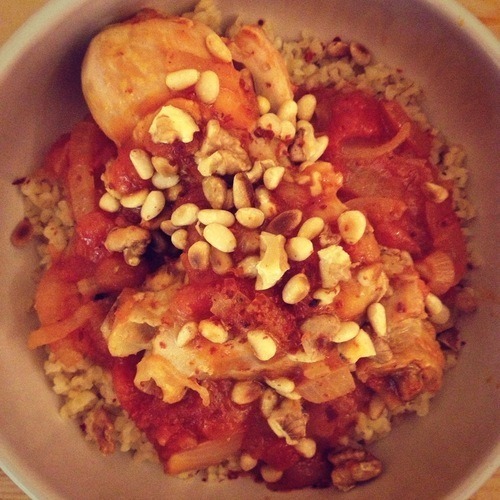 Serve chicken and sauce over the bulgur wheat and top with nuts.